Japanese baseball considers itself to be a major league, and the quality and level of play is quite high. However, the ballpark facilities and availability of certain items could be improved to make fans feel more like they are at a big league game. Home run dimensions on the fences. Some ballparks (Kyocera Osaka Dome, for example) post the distances in meters from home plate to the left — and right-field poles and the center-field back screen. However, most (including Tokyo Dome) do not. In 1970, when I first started going to games in Japan, every stadium displayed the numbers on the fences. Curiously, whenever there is international competition, such as World Baseball Classic games, or when major league teams have opened their season at Tokyo Dome, the dimensions are affixed to the outfield walls in meters and feet. But, as soon as the visitors leave town, the signs are removed. Out-of-town scoreboards. No stadium in Japan has one, whereas every major league park in North America keeps track of other games in both leagues, constantly updating the scores as the games move along. Here, at Central and Pacific League games, tallies of out-of-town action might be flashed on the main scoreboard once or twice a game at most. At Yomiuri Giants games at Tokyo Dome, the other CL and PL game scores are displayed only once—between the bottom of the eighth and top of the ninth innings. Also, they are removed so quickly, it is sometimes difficult to read and comprehend them before they are gone. With the tight pennant and playoff races, the fans must be interested in what’s happening with the other teams around the country. Video screens separate from the main scoreboard. These days, many ballparks in Japan use the entire area of the main scoreboard to run video commercials, fan club news or other promotions between innings. So, if you want to check the score or who’s in the lineup, all that disappears for a couple of minutes, and you need to wait. More stadiums should be like Kobo Stadium in Sendai, home of the Rakuten Eagles. There is the main scoreboard in center field where the lineups, line score and other basic information is displayed constantly throughout the game. To the right of that is a second board that shows the videos and specialized statistics such as batter-pitcher head-to-head match-ups. That giant screen was put up at the direction of Rakuten owner Hiroshi Mikitani to block the view of residents of an apartment building located behind the right-center field bleachers. Hey — if you want to see the game, buy a ticket, right? Tarps that cover the entire infield. Half the franchise ballparks in Japan are domed stadiums where it doesn’t matter but, at the outdoor ones, the covers that are supposed to protect the pitcher’s mound and dirt areas around home plate and the bases are not so great. They are nothing like the rolled-up tarpaulins you see at major league stadiums where a proud and professional grounds crew can get the entire infield area covered in less than two minutes, even in a downpour. Mazda Zoom Zoom Stadium in Hiroshima is probably the most major league-type ballpark in the country, with its natural grass surface and traditional curved dirt infield area. Tarps similar to those on cylinders along first and third base at Yankee Stadium would be ideal to cover the entire infield area. However, the Carp ground crew has small tarps to cover only the dirt areas during rain delays, and it takes forever to fold up the sheets and carry them to a storage area on the other side of the center field fence after the rain stops. Outdoor bullpens. Just about all the parks in Japan — domes and outdoor ones — have bullpens that are out of sight to the fans. They are usually under the stands, and I believe this is one reason why the games take so long to play. When a pitching change is made during an inning, the umpires cannot see what the incoming reliever is doing, and it sometimes takes the next pitcher several minutes to make his way to the mound. 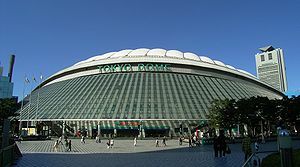 Most late-inning hurlers say they prefer the bullpens on the field, such as at the Yakult Swallows’ Jingu Stadium or the Lions’ Seibu Prince Dome. I wish they were all like that, so we can see who’s warming up and about to enter the game. At one time, they were. Scorecards. As a youngster, I can recall going to games in New York at Yankee Stadium and Shea Stadium and, even before that, the Polo Grounds and Ebbets Field to see the New York Giants or Brooklyn Dodgers. There was always a vendor right inside the ticket gate selling scorecards (25 cents back then) and pencils for an extra nickel. Some Japanese teams are selling program-type magazines, but I don’t see any scorecards inside. If you want to keep score, you will have to bring your own scorebook — and a pencil. Pizza. Most of the main Japanese ballparks sell pizza—usually Domino’s or Pizza-La, but there a few stadiums where pizza cannot be found. Seibu Prince Dome is one. They had a Domino’s stand in right field two years ago, but it has disappeared. Every baseball stadium around the world should sell pizza, right?